I switched to the Crank Brothers Egg Beater 1 pedals after using SPD clips with Wellgo pedals for many years. I never really had any complaints with the SPD pedals, except for clipping back in with mud build up. I also had not tried anything else to have a comparison with. I really like the functionality of the Egg Beaters, but I did have bearing problems after one season with these Egg Beater 1 pedals. However, I did like the functionality of them enough to replace them with another set of Crank Brothers pedals, but this time with the Candy 3 pedal that has a better bearing package and a small mini cage around the clip spindle. I did liked the tension adjustability of the SPD pedals, but thought I would try out something new and a little more simple. The biggest thing I noticed with the Crank Brothers pedals is that I have less issues getting clipped in on the fly and rarely does mud get in the way of me getting clipped in. The cleat seems to clean out quite easily and naturally in the process of clipping in. My biggest negative is that there is no adjustment, but after a season of use, they were still functioning aside from the bearings coming loose. I liked the functionality of them enough to buy another pair, but upgrading to better bearings with the Candy 3 model. I’ve used the Candy 3 model for a season now with no problems. I will mention, that I think the clip in functionality is slightly better with the Candy model. I think the mini cage around the 4 position spindle, helps find the correct clip in position quicker. One other thing I have noticed on the Egg Beater pedals in comparison to the Candy 3 pedals is that the wings on the Egg Beater 1s are stamped steel and I can see how they have worn faster and even bent slightly vs the stainless wings on the Candy 3 pedal that are in really good shape still. 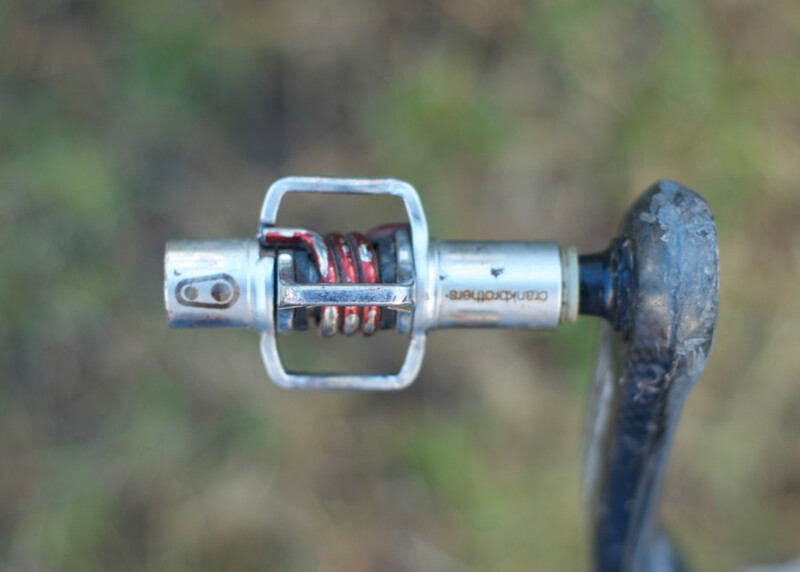 Standard Cleats – The pedals come with Crank Brothers Premium Cleat with a 6º float and either a 15º or 20º release angle depending on how you mount the cleats on your shoe. I mount mine with the 20º release angle. These obviously came with mounting bolts as well. I would have ranked these much higher if it wasn’t for the bearings loosening. I did find out that Crank Brothers has a 2 year warranty, so I will be sending them in for warranty coverage. I really like the functionality of them, but a bearing failure of any kind in 1 season is not acceptable. Like I said above though, I liked the functionality enough to try the Candy 3 pedals with a better bearing package and all around better material selection. These would have come in right behind the Candy 3 ranking if the bearings would have held up.